One of the most (if not the most) important sacraments in the liturgical calendar is the Holy Communion, also known as the Lord's Supper. If you are Roman Catholic, you would call it the Eucharist or the Mass. Regardless of the differences in theological opinion, all if not most will agree of its spiritual significance. You may be a Roman Catholic who believes in the real transformation of bread and wine as the physical Presence of Christ.You may be a Lutheran who may not agree with the RCC version's of "transubstantiation," but in the local transformation of bread and wine into the body and blood of Christ. You may be a Reformed who sees the Lord's Supper more as symbolism or a Baptist who argues that Christ's presence may not be physical but sure is real. You may also be a Pentecostal who refuses to be drawn into the physical presence debate, but insists on the spiritual significance of the whole Eucharist. One thing is for sure, the Lord's Supper, or if you are Roman Catholic, the Eucharist (or Mass) is perhaps the most significant ritual or sacrament the Church can observe and take together. During the days of Paul, there are no denominations that we talk so much about today. Instead, there are divisions. There are multiple parties trying to boast that their faith is better than one another. The Corinthian Church was in a state of disunity and discord. Paul reprimands them for divisions (1 Cor 11:18). He points out the factions among them. He blames the church for the lack of unity to share and to care for one another. There are disparate levels of wealth, with the rich feeding only themselves and the poor left with nothing. Worse, some even uses the Lord's Name in vain by eating unworthily at the Lord's table with the haves looking down on the have-nots. Instead of coming to the Holy Meal in the Name of Christ, they come in the name of self! Thus, Paul tells them to examine their own selves, lest they are punished with death (v30). While we do not want to busy ourselves with the denominational differences, it is appropriate for us to observe the spirit rather than the letter of the Lord's Supper. 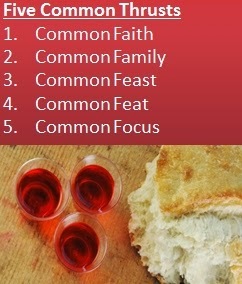 Let me share five common elements of the Lord's Supper which I believe is common ground. The details may be somewhat different according to your religious persuasion, but the general thrust is the same. When we take the Holy Communion, whatever the language, whatever the procedures, whatever the sacramental differences, we all believe that it is in the Name of Jesus Christ. We believe that the sacrament of bread and wine is instituted by Jesus himself. The bread has a long history to the way manna has been given to the Israelites as a sign of God's continued providence. It is a recognition that Jesus is the Bread of Life (John 6:35). Jesus is the focus, the Person in which we express our faith. By the actions and rituals, we not only speak out the words of Christ together, we live it out. Thus, it is significant that we eat and drink in the Name of Jesus, the One who had instituted the whole sacrament altogether. Without this common Person, there is no common faith. With this Common Person, we have a common faith. "So then, my brothers, when you come together to eat - wait for one another -"
In our modern era of efficiency and time-driven efficacy lifestyles, we want to keep to time. We want to get through with the routine so that we can start working on the next. We are so busy that we cannot wait. The recognition of one another as family means learning to wait for one another respectfully. One of the most cherished practices in any Christian family dinner is to wait for one another until a prayer of thanksgiving has been said. My family has learned to wait until all are seated and eat only when grace is said. Ever thought of why Jesus chose the simplest elements? That is because bread and wine are some of the most readily available food in cultures around the world. Bread is pretty much a staple food in all regions of the world. It is inexpensive and widely available. Wine on the other hand has also been replaced with grape juice. What strikes me is the smallness of the piece of bread (or wafer) and the little cup. Something so small, yet the meaning is so significant. This common feast has several important points. First, it comes out of a main body. The bread had to be broken in order to become little bits to be shared. The wine has to be poured out into various cups. In both circumstances, it is a one-to-many arrangement, reminding us that it is from God to the rest of us. Second, the smallness of the elements suggests to us that the purpose of the Holy Communion is not about filling our stomachs full of food. It will never be sufficient. What is helpful is that the little element we partake allows us not to be distracted by the food per se, but to remember the bigger significance the small element brings us. Third, this common feast is shared. The sharing of food is a powerful example of unity in the faith. Everyone eats from the same source, consumes the same quantity, and savours the same food. This sameness gives us a common sensual touch. Before the elements are distributed, the set of rituals allow all to participate as one body. The routines are repeated and followed religiously. With our modern fascination over all things new, the latest fads, and the most current news, it is hard to fathom why we continue to observe an age-old tradition weekly and for some, monthly. Here, we note the wise observations from Dr Gordon T Smith, who notes the benefits of simplicity over novelty, which is essentially counter-cultural, something that Jesus is widely known for. Sometimes, I shudder when I hear of people saying that we must examine our own selves thoroughly before taking Communion. While I am not opposed to the idea of self-examination so that we can check our own selves, I am more concerned about the unwitting over-emphasis on individual selves at the expense of the corporate body. If I happen to expose all known sins before God, does that make me more holy before God? No. If I only manage to highlight a few wrongdoings, does that mean I am unworthy to take the Communion? No. If I focus just on my own self, am I more concerned for myself and my own feelings, forgetting how my actions impact the wider body? Maybe. Self-examination must have a dual-legged focus. One leg examines the self to propel ourselves into the realm of humility and need for God. The other leg reminds us again that self-examination needs to have the bigger body of Christ in mind. That is to say, we all come, regardless of our individual worthiness, but in a corporate gathering of forgiven sinners saved by grace, not of works, lest any one of us should boast. 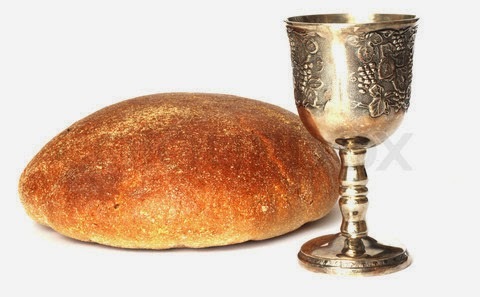 When we take the Lord's Supper, remember the commonness more than any one novelty. Note the simplicity of the whole sacrament. Be reminded that we come under a common God in a common faith. We eat a common feast. We belong to the same family of faith. We perform a common feat. We maintain a common focus on Christ. All of these are emblems of unity, symbols of solidarity, and images of what a family of God look like. It is no light matter. Let me close with one reason why we do the Holy Communion. It is simply obeying what Christ has taught us. The Old Testament has taught us. The New Testament does likewise, that obedience is better than sacrifice. Taking the Holy Communion for believers is an act of obedience.